It was only Day 2 of the Gumroad Small Product Lab when I decided not to bother participating. No, it was late on Day 2, even! After signing up on Day 1, I hadn’t really decided to launch a product; signing up was driven more by curiosity than anything else. My hope was that Gumroad would be offering some secret marketing info that I could use to promote my podcast. I had no idea how close that hope would be to what actually transpired. Chatting with friends on Day 2, I deliberated over whether or not to do this, and what kind of a product I could do. In typical form, I had a hard time thinking truly small – a hallmark of my career is my tendency to over-engineer everything I do. Usually, this works in my favor; on a 10-day time-span, over-engineering would yield the same result as not starting at all; a no-finish. I AWOKE ON THE MORNING OF DAY 3, UNEASY. Just so you don’t get the wrong idea, this is not a sad-sack story. I have had plenty of success in my career – operating a busy web development consultancy for 12 years, and hosting a reasonably-popular podcast – but the one type of career success that proven elusive for me is product (but not for lack of trying – multiple times). My recent product efforts to launch a product had been centered around a web app, but frankly, I felt like I needed a win, badly, NOW. I felt a powerful need to get on the scoreboard much sooner than my web app would allow. And it looked like Gumroad was offering a great opportunity, with plenty of support. Taking the time to catch up, I read the e-mails Gumroad had sent out for Days 1, 2 and 3. I did some research based on my own areas of interest and expertise. I took notes and thought out loud. Again, I turned to my friends and colleagues, most of whom have stories similar to mine, and some of whom have successfully manage to produce and profit from their own products. I threw out ideas, I expressed concerns, I asked questions. My friends did their part and showed me no mercy, shooting down ridiculous ideas, poking holes in ridiculous concerns, and helping me to refine kernels of plausible ideas. Ultimately, I decided that my small product would be a book. After a few mental iterations, I decided that the book would be about podcasting, for beginners. A final chat with my friends helped me determine that although there was no way to predict success, at the very least I had a workable idea of the appropriate scale, that addressed a fertile market, that was worth the time to launch a product in. It was Day 3. I was nervous, and I was late. But I knew I had to do this, that all of the false starts over the past several years would be worth it if I could just launch a product this time, sales or no (though I admit, the idea of doing a product that doesn’t sell seems wasteful to me, and best avoided whenever possible). I sat down to write, preoccupied with my own doubts about my late start, and was immediately thunderstruck by a thought: I’ve already written a big chunk of this book! Frantic, I began to dig through my e-mail. Here and there, spread out over the past 2 years, were messages from aspiring podcasters – messages that I had replied to with advice regarding developing a concept, recording on the cheap, focusing on the essentials of starting a show quickly. I also found messages to my assistant, containing guidelines for helping me to produce my podcast. In these messages, I would find the raw material for my book. Turning my attention to chat logs, I found that in the course of describing my product vision to my friends, I had written a significant amount of material that could serve as even more raw material for the book. With my pangs of doubt beginning to fade away and a steadily-growing blaze of desire, I worked late into the night to outline my book and start plugging chunks of e-mails and chat logs into the various sections of the outline. I knew I’d have to re-write virtually all of it, but that seemed infinitely preferable to starting from scratch and flirting with the dreaded Blank Page Syndrome. I’d never manage to launch a product that way, I was certain. The last thought passing through my mind before sleep finally took me during the (very) late hours of Day 3 was “I think I can do this”. I awoke easily, with a strong sense of focus. After spending the first half of the day attending to my consulting obligations, I began to work on my book again, cutting & pasting sections of old e-mails and chat logs here and there, hanging meat on the skeleton that was to become my book. It was also on Day 4 that I began to consider things like a title, a website, and a promotional plan. Gumroad sent a nice e-mail about setting up a landing page using their Audience feature to build up a following before trying to launch a product, which I was only too happy to make use of. With my Audience page complete, I began to think about other means of promoting my eventual product. I decided that I would use a lead magnet – a free piece of content – to draw attention to my book. As my work drew to a close on Day 4, I had 15 pages written – all from re-using and re-writing my own previously-written private material about podcasting. My head hit the pillow that night with a singular though – “I know I can do this!”. Once again I began working on consulting projects until noon before turning attention to my book. I had used all of my pre-existing material, and now had to begin to create content. “I’m past the easy part” I thought, “and now I’m going to have to start doing this for real”. That afternoon was spent writing like I’ve never written before. 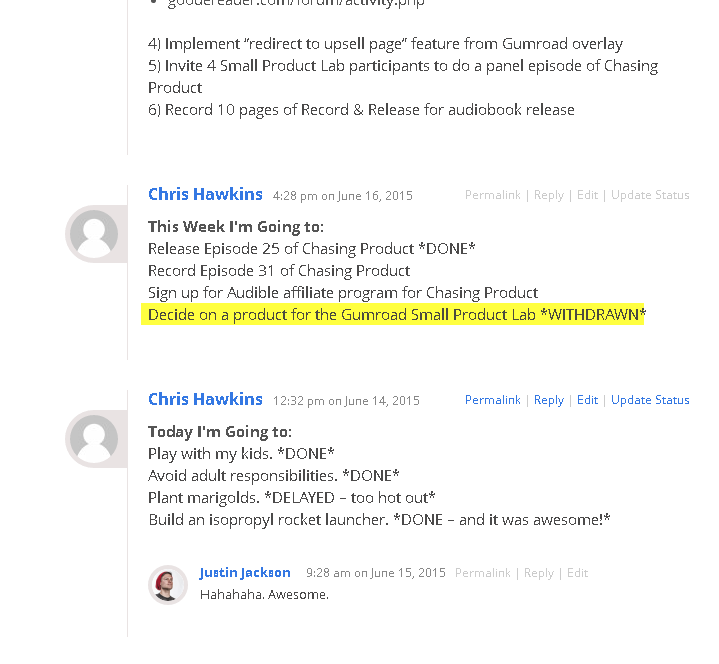 The Day 5 e-mail from Gumroad was about building an audience. I knew that the Audience page would help, and I knew I could drum up some attention from my Twitter friends, but I also knew that come Day 10 when I had to launch a product, I had a pretty big head start on building an audience. Unlike many other competitors, I had a 300-person e-mail list comprised of people who follow my podcast, my web-app-in-development, and my blog. Everyone had signed up because they were interested in a project of mine, so it seemed like fair game to mention my book as well. Ultimately I decided that this list would have to be the foundation of my promotional plan, alongside Twitter, posting to Reddit, and my blog. I signed up for HootSuite to help me automate my tweets, and devoted a bit of thought to how best to spread the word about my book. I also reached out to hire a designer friend to create the lead magnet I intended to use to draw attention to my book. By re-purposing my internal production workflow outline and having it turned into an infographic, I now had a high-perceived-value item to offer in exchange for collecting even more e-mail addresses. If you’re curious, you can download the production workflow infographic here. At the end of Day 5, I had over 40 pages written, a beautiful infographic lead magnet, and a plan! That night, I could barely fall asleep, my brain was so focused and alive. “I. Am. DOING. This!” I thought as I finally fell asleep. From the get-go, I worked on my book as I worked on my consulting projects that morning, started tweeting to drive people to my Audience page, and hired a designer to come up with a cover graphic, all the while writing, writing, writing. I was in an unusually high state of focus, with plenty of energy. It was great. The Day 6 e-mail came and I barely glanced at it – something to do with motivation? I barely noticed. I was in the zone. Final outcomes for Day 6? The book was up to 60 pages. I had cover designs coming in 2 days. 8 people signed up on my Audience page. And I hit the sheets that night with a sense of confidence and excitement that I hadn’t felt in years: “I’m going to absolutely crush this”. THE MINUTE I AWOKE ON DAY 7, I KNEW SOMETHING WAS WRONG. My thinking was blurry. My body was slow. Every boxing, kickboxing, and weightlifting injury I ever incurred over my 42 years seemed to have come back to life overnight, leaving me feeling like a patched-together dumpster old old traumas. Sitting at the computer, I did a bit of editing, answered a few e-mails to keep my consulting business going and my cover design project on track, and fought the urge to nap. My body was SCREAMING at me to go back to bed. For the rest of Day 7 I attended to some lightweight consulting billables and little else. I didn’t even go into the office, I worked from home (lazily) and played Wii with my daughter, in a fog the whole time. I was seriously doubting my ability to launch a product at this point. My only product work consisted of forcing myself to write 5 pages and do some tweeting. I also browsed the Gumroad Small Product Lab Facebook group, trying to draw inspiration from all the brilliant folks who were also participating in the Lab. I went to bed early the evening of Day 7, vowing that “tomorrow I’ll be back to killing it”. AS THE SUN ROSE ON THE MORNING OF DAY 8, I WAS FREAKING OUT. HARD. I had hardly slept, and felt terrible. It dawned on me that my work on Days 3,4,5 and 6 had been intense, fueled by excitement and way more caffeine than I normally consume, and accompanied by WAY too little sleep – about 4 hours per night. I may have been able to work like that when I was a bushy-eyed 21-year-old, but as a 42-year-old diabetic with a business to run on top of participating in the Small Product Lab, I needed to work much smarter. My mistake was one of scope – I had allowed my product to swell up to something much bigger than I anticipated at the start of the project. 1) Do I give up? The answer was “not just no, but HELL no”. I was so close; I could smell blood in the water, and I wasn’t going to let anything stop me at this point. 2) How, then, do I proceed? The answer to this was “the scope of my product now consists of whatever I’ve written so far – editing is all I can do now”. 3) How hard do I push? The answer to this was “exactly hard enough to release on Day 10, and no more”. And just like that, I had figured out how to keep moving in a way that I was able to keep moving, and that is what kept me in the contest. I a gave myself permission to more-or-less take a rest day, as I had done on Day 7. I knew that if I pushed too hard at this point, my attempt to launch a product would fail. 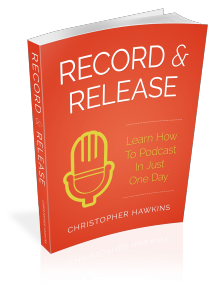 My product was now set; “RECORD & RELEASE: Learn How To Podcast In Just One Day” would be 65 pages and not a page more. Although I did an edit pass, I didn’t add a single word to the manuscript. My only productivity that day was approving the cover art for my book, and registering a domain for the website I intended to use for the book. “I got this. I got this.” I told myself as my head hit the pillow very early in the evening of Day 8. DAY 9 WAS A RETURN TO DAY 6 FORM. I ran my consulting shop, edited the book, formatted the book, tweeted, built the sales page for the book, and outlined my release plan. I knew that losing Days 7 and 8 was bad, especially since I didn’t start until Day 3 in the first place, but I also knew that I had broken myself of the “overdoing it” habit at last. Every action I undertook that day, I saw straight to the heart of. Nothing that didn’t exist in the critical path got an ounce of my attention that day. I caught up on the e-mails from Days 7, 8 and 9 all at once, consulted with my friends regarding pricing and my promotional plan, and put all the pieces in place for Day 10. Gumroad turned out to be very easy to use, which was important to me as a first-timer, and as someone who was working against a 10-day plan; I flat-out did not have time to learn anything difficult if I was going to launch a product. I was weary, but focused. I felt confident that I was doing excellent work, and that no matter how my launch day turned out, seeing this challenge through was going to pay dividends of one sort or another going forward. For inspiration, I again turned to the Gumroad Small Product Lab Facebook group, marveling at some of the “I wish I’d thought of that!” products that my fellow participants were posting. That night, I went to sleep feeling eager for the morning. I felt energized. “I wonder if I have a shot at winning this whole thing?” echoed in my head as I fell asleep. ON DAY 10 I AROSE EARLY – I WAS READY TO LAUNCH A PRODUCT. One thing that I hadn’t planned on – that ended up making a big difference – was being listed on Product Hunt. I had decided to skip PH entirely. I was uncomfortable with how little I knew about the site and the culture and the users, and figured it was probably not worth the trouble. I was completely wrong, and I’ll write about that another time, but Product Hunt ended up being absolutely worth my time. As I began my Tweeting/social media/forum-posting campaign, I noticed that 8 sales came in almost immediately. That only amounted to $80, but it was the most exciting $80 I’ve ever made, hands-down! Scheduled Tweets were going out, I was posting on product sites and forums hour after hour, and the sales kept coming in. I didn’t work THAT hard on launch day, because I already had my e-mails & postings staged, but it was exhausting because I was paying intense attention to so many things. Turns out that when you launch a product, there are a LOT of details to keep track of! Posts to the Gumroad Small Product Lab Facebook group where plentiful, with launch announcements for loads of clever products created by enterprising people popping up in the feed all day long. One by one I watched each participant launch a product of his or her own. It was awesome. When I went to bed in the evening of Day 10, I had $240 in sales showing up in my dashboard. “Well, that’s it” I thought. “That’s my big launch-day spike; after this it’ll be a trickle and I’ll need to come up with a plan to keep it rolling.” I was OK with this; I felt proud that I’d not just finished the product, but launched it! I AWOKE TO FIND $600 IN SALES ON MY DASHBOARD ON DAY 11. I have no idea what the heck transpired on Gumroad after I went to bed, but whatever it was put $400 in my pocket while I was sleeping. The thought that accompanied me into sleep on Day 11 was “What a fantastic day it’s been”. DAY 12 IS WHEN THE WINNER WAS TO BE ANNOUNCED. The big winner, the keeper of all the marbles, the #1 creator of the Small Product Lab. I’m not going to lie – I’m a confident guy, and participating in this Lab made me more so. I knew I was doing good work, and in my heart of hearts I really wanted to win. Like, really wanted to win. Not because I’m a hyper-competitive jerk, but because I felt absolutely overjoyed at what I’d managed to do over the course of the preceding days with the encouragement and support of Gumroad, my friends, and my family, and wanted very much to finish off my efforts to launch a product with an exclamation point. D.J. Coffman won, and he absolutely deserved to. His product was clever and artistic, his promotional tactics were more expansive than anyone elses, and his overall game was just that much sharper than the rest. I may not have won, but my product & I did receive an Honorable Mention, which was awesome, because it was not, by any means, guaranteed. There were some impressive products created during this challenge! But once it was all said and done, I felt like a winner anyway. Checking my e-mail on Day 12 revealed some interesting developments. A Japanese media outlet had reached out to me for an interview. 2 people had e-mailed me to inquire about purchasing a consulting engagement to have all their podcasting infrstructure set up for them – website, Blubrry account, iTunes registration, blog, everything. Just $600 in sales and some traffic had opened up this interesting little handful of opportunities, without even winning the contest? I was impressed. I also wondered how people who sell, say, 1,000 units right when they launch a product can even cope with all the ancillary attention. As I finished my Small Product Lab experience, I found myself with a potential new line of business, and a new-found sense that success with my own product is a possibility for me. Take away the sales, and all of those things are still well worth the effort it took to complete the challenge. Going forward I have a better sense of my own creative and marketing capabilities, and virtually no doubt about my ability to launch a product – after all, I just did it. I also find myself with new friends in the form of the fellow participants I met in the Facebook group. A few of these participants – including the winner, D.J. Coffman – will be appearing on an upcoming episode of my podcast, Chasing Product, to talk about our experience hustling to launch a product. Feel free to join my mailing list to be notified when the episode goes live – these are all smart, interesting people and it should be a great show. Gumroad put out the call, and dozens of creators answered. I’m incredibly thankful for that, and for what completing this challenge has done to change my perspective and give me the opportunity to get on the scoreboard as a product creator. There’s another Gumroad Small Product Lab starting on July 27…are you going to launch a product? what will your product be?